This begins a five part series about claim charts. We start with a brief history of the Claim Chart, continue into the Patent Local Rules, following up with practice pointers to help you better create Claim Charts. The history of the Claim Chart is not easy to parse. Most cases involving Claim Charts only briefly mention charts. Court opinions rarely incorporate a full Claim Chart into the decision. Given this seeming lack of attention to Claim Charts by the Courts, how did they become so ubiquitous in patent litigation? One of, if not the earliest use of claim charts in litigation dates back nearly 80 years to 1937. Christensen v. Bragg-Kliesrath Corporation, 19 F. Supp. 496, 498 (N.D. Ind. 1937). In Christensen, the plaintiffs’ patent expert Walter T. Fishleigh interpreted the claims at issue using charts with analysis to show infringement. These charts led the plaintiff to drop their case and seek a reissue of the patent to add claims specifically defining their invention before suing again. In 1976, there was discussion about ITC procedure at the Third Annual Conference of the United States Court of Customs and Patent Appeals. Third Annual Judicial Conference of the United States Court of Customs and Patent Appeals, 72 F.R.D. 239, 264 (1976). Of particular interest was a discussion on the specificity required in a respondent’s answer to a complaint. It was noted that the rules contained detailed instructions for a response that included, in patent cases, a claim chart. This section of the rules no longer contains language directed to charts. See 19 C.F.R. § 210.13. The rules under discussion at the Conference suggest that the Claim Chart had become a favored tool for patent litigation. 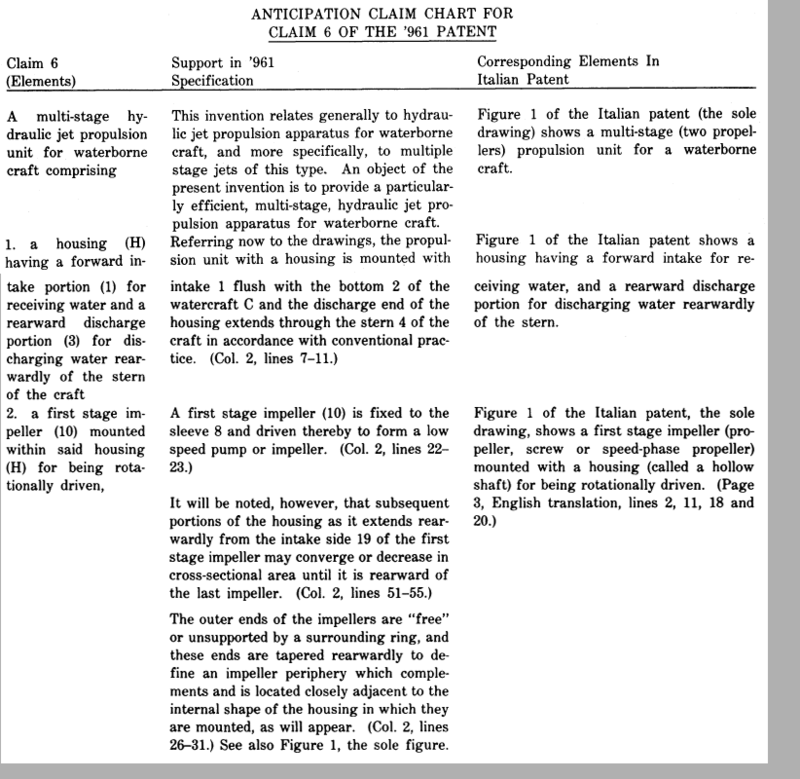 An example claim chart from the 1980s can be found in Twin Disc, Inc. v. U.S., 10 Cl. Ct. 713, 728-30 (1986). During the 1980s, some reported decisions suggest that the court required the submission of claims charts. Summagraphics Corporation v. U.S., 1 Cl. Ct. 381 (1983). In Summagraphics, the court required that the plaintiff’s submit Claim Charts in both its Memorandum and Order of Preliminary Conference, and its Standard Pretrial Order on Liability. The practice of using claim charts to accompany court submissions gained some traction in patent litigation during the 1980s. In December 2000, the Northern District of California promulgated the first set of Patent Local Rules. The practice spread and many district courts began to implement Patent Local Rules that require Claims Charts in patent litigation in order to streamline the process. Although this practice started in the Northern District of California, the rules requiring charts spread to at least 28 other district courts. As more courts adopt Patent Local Rules, it would seem that the Claim Chart is here to stay. In 2008, James Ware and Brian Davy published the law review paper The History, Content, Application and Influence of the Northern District of California's Patent Local Rules in the Santa Clara High Technology Law Journal (Volume 25, Issue 4, Article 8). The article describes the genesis for the different rules and key cases that have shaped the rules.